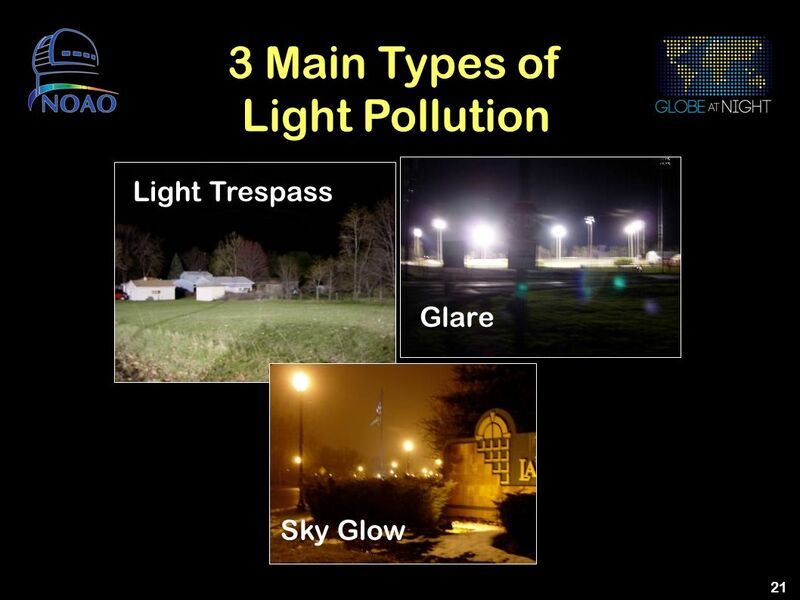 Light pollution is artificial night sky brightness, directed up toward the sky and wasted. 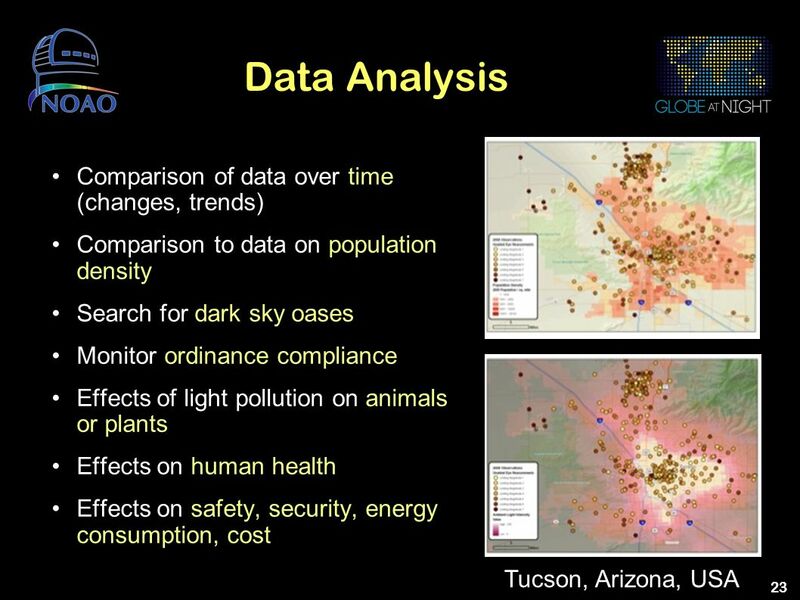 The International Dark-Sky Association estimates that one-third of outdoor lighting escapes unused into space, causing light pollution. 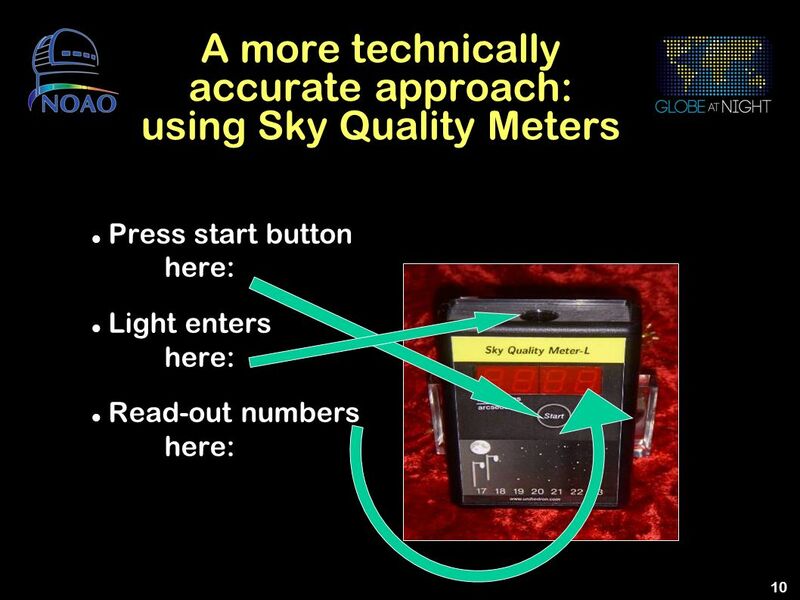 Under an unpolluted sky we ought to see 5000 stars, yet we see only a couple hundred from most suburban areas. 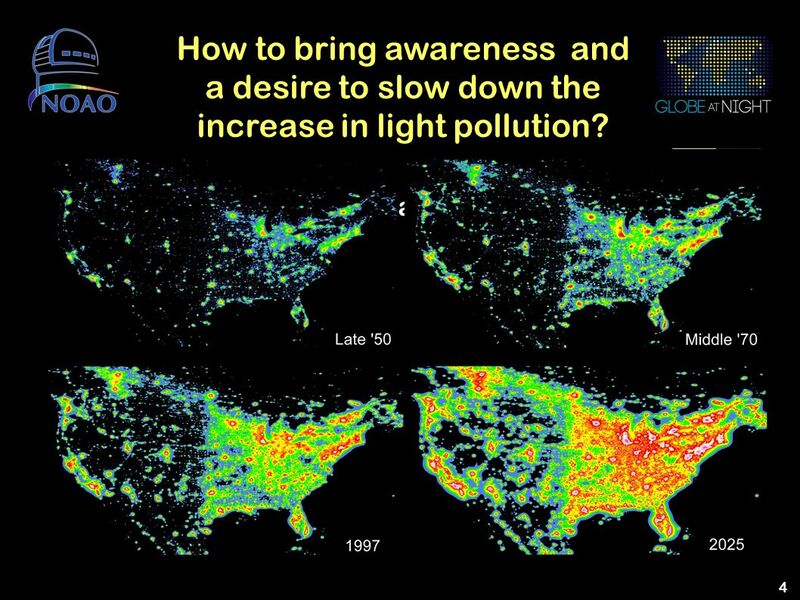 Two thirds of all US citizens cannot see the Milky Way galaxy from where they live. 2008 marked the first year half of the world’s population lived in cities. 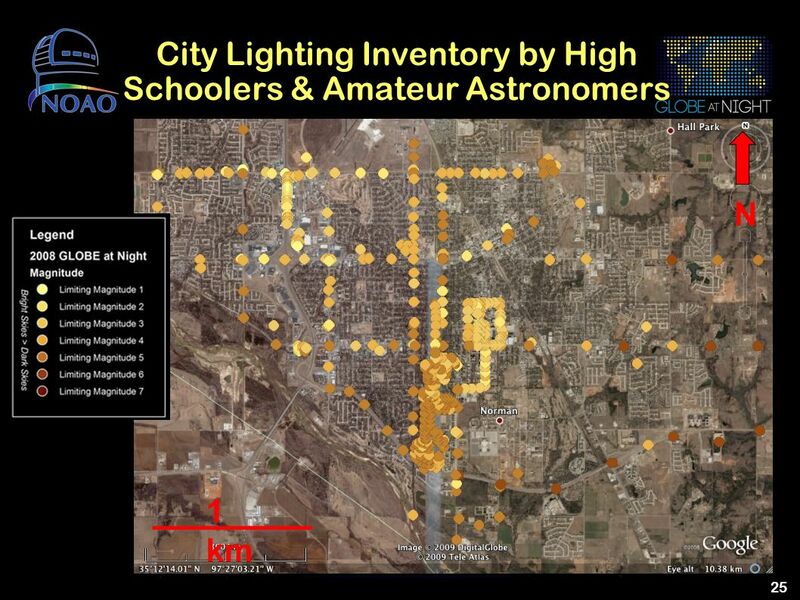 As you can see in this nighttime image of the world, cities are traced by the light pollution they produce. 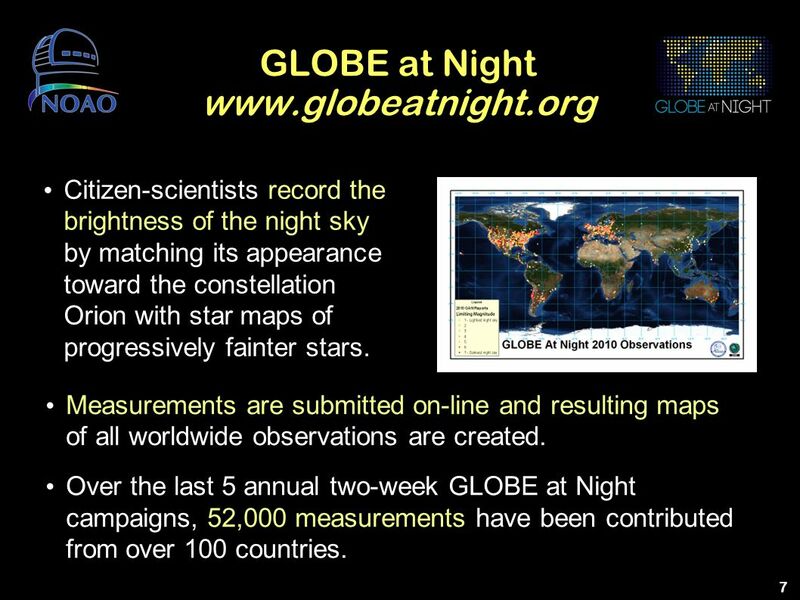 Here you can imagine the world as ever-growing urban constellations, diminishing our ability to see the stellar constellations. Is this the heritage we want to leave our children? 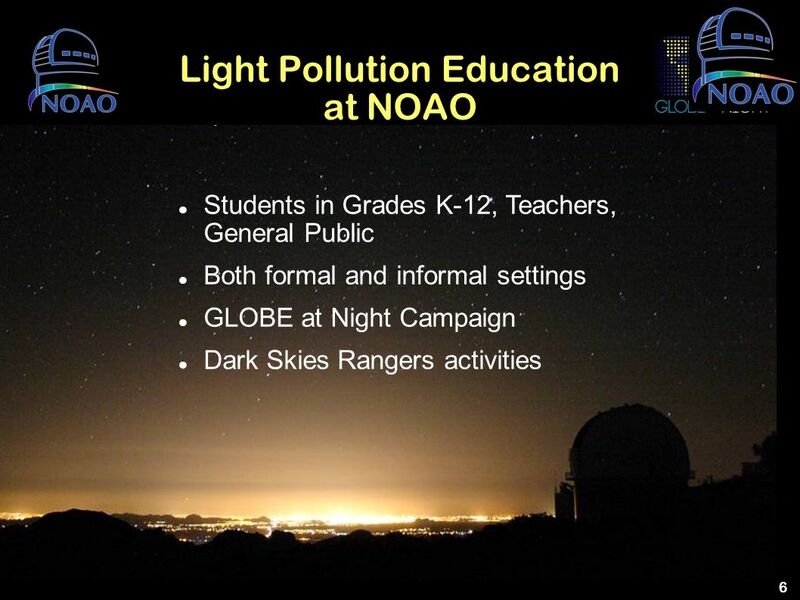 The good news is that although light pollution is a global issue, it has local solutions. 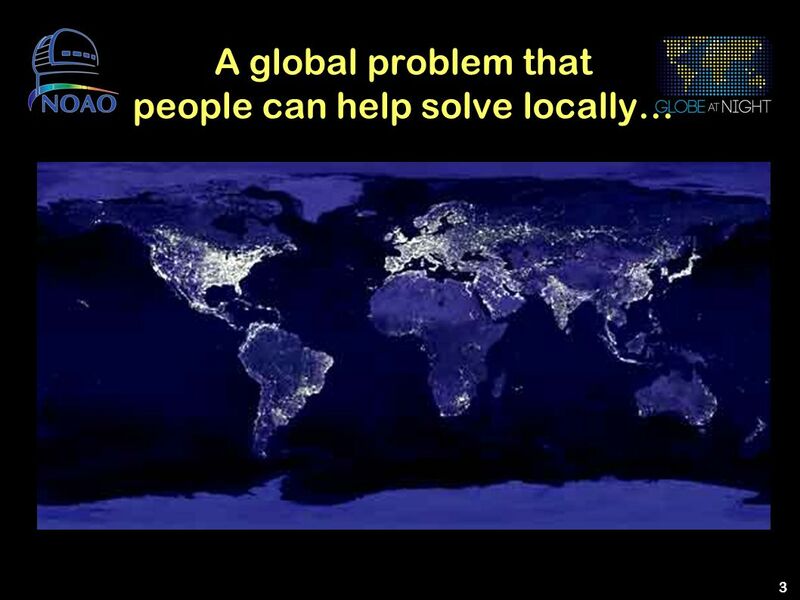 The first step is to make people more aware of this global issue and that they can be part of the local solutions. 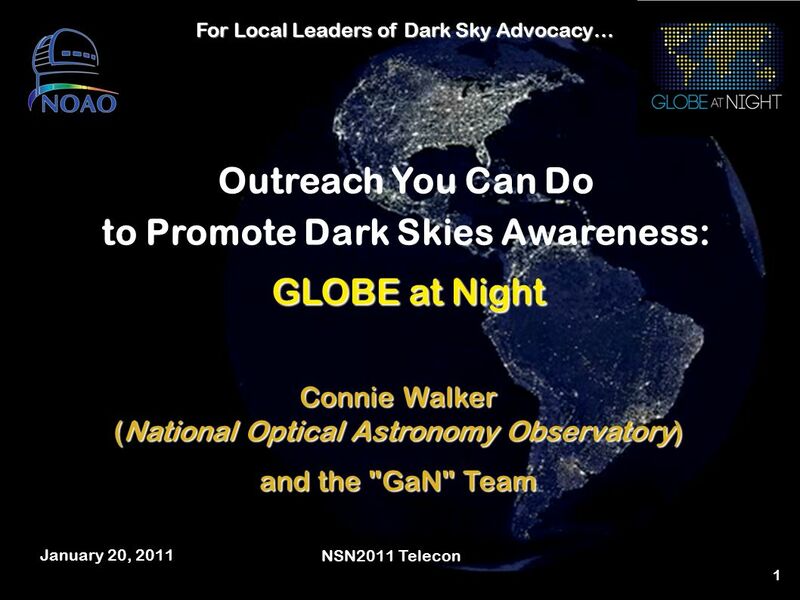 This is where you as amateur astronomers come in and can help significantly by providing outreach to the public, especially w/all of the outreach you do and all of the knowledge and skills you possess. 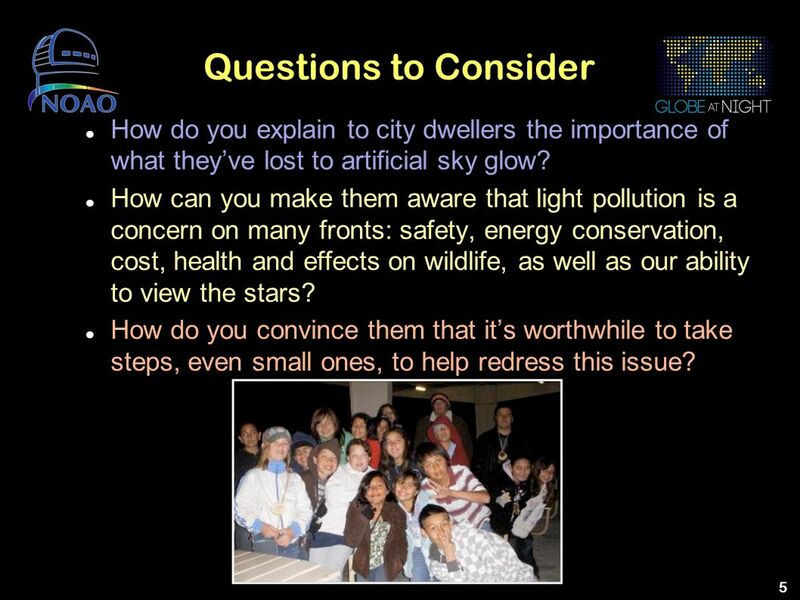 5 Questions to Consider How do you explain to city dwellers the importance of what they’ve lost to artificial sky glow? 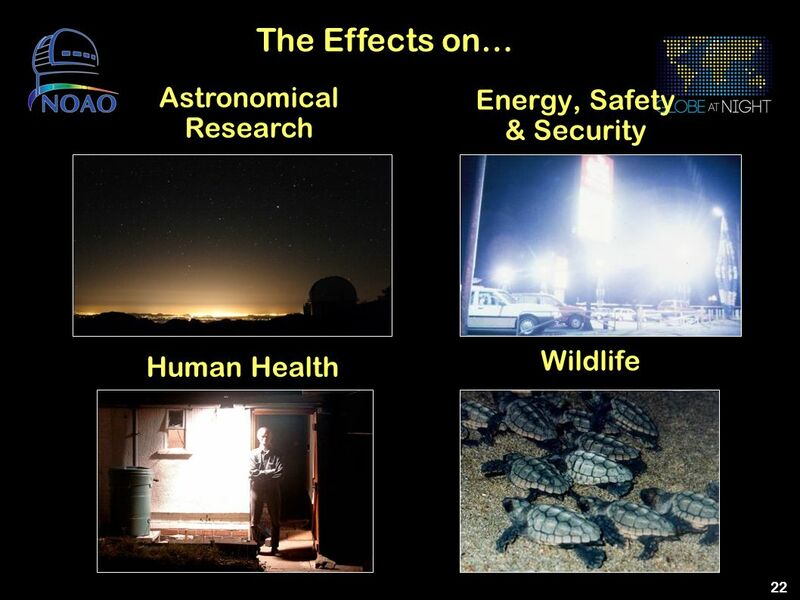 How can you make them aware that light pollution is a concern on many fronts: safety, energy conservation, cost, health and effects on wildlife, as well as our ability to view the stars? 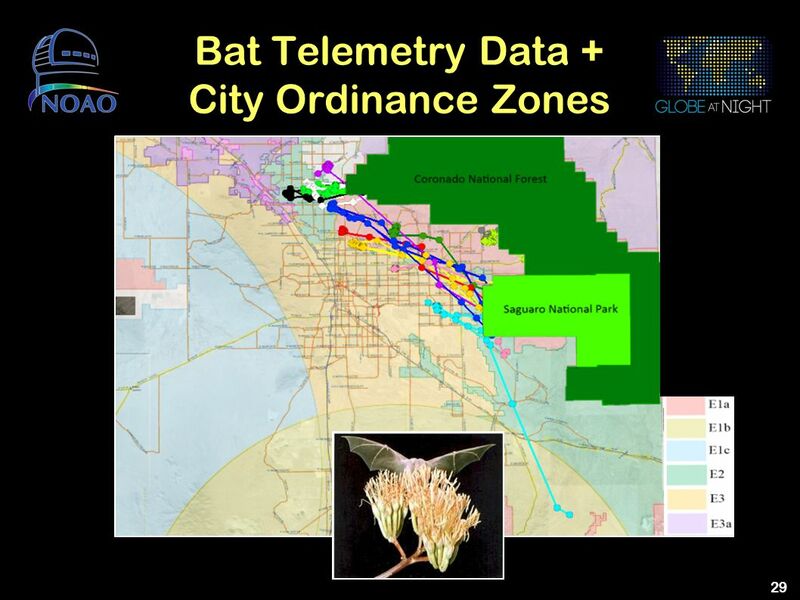 How do you convince them that it’s worthwhile to take steps, even small ones, to help redress this issue? 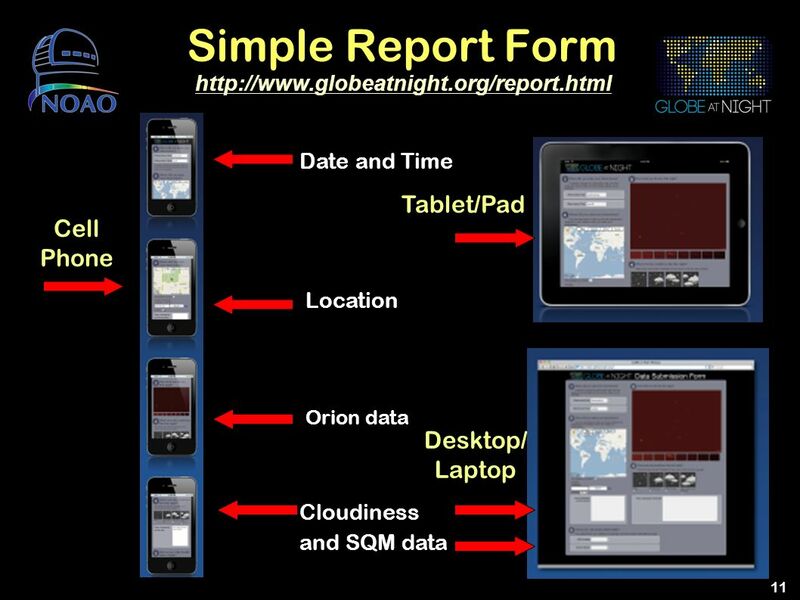 Citizen-scientists record the brightness of the night sky by matching its appearance toward the constellation Orion with star maps of progressively fainter stars. 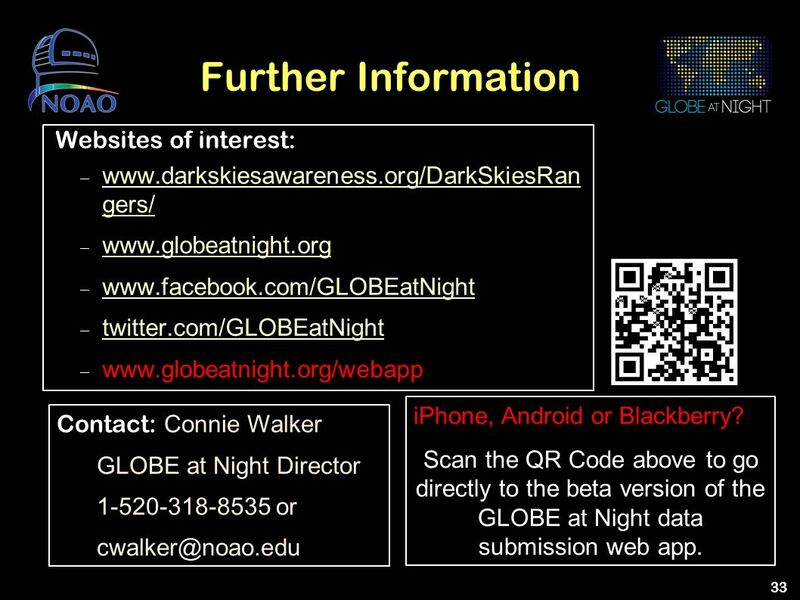 GLOBE at Night was also one of the flagship programs for the Dark Skies Awareness Cornerstone Project for the International Year of Astronomy. 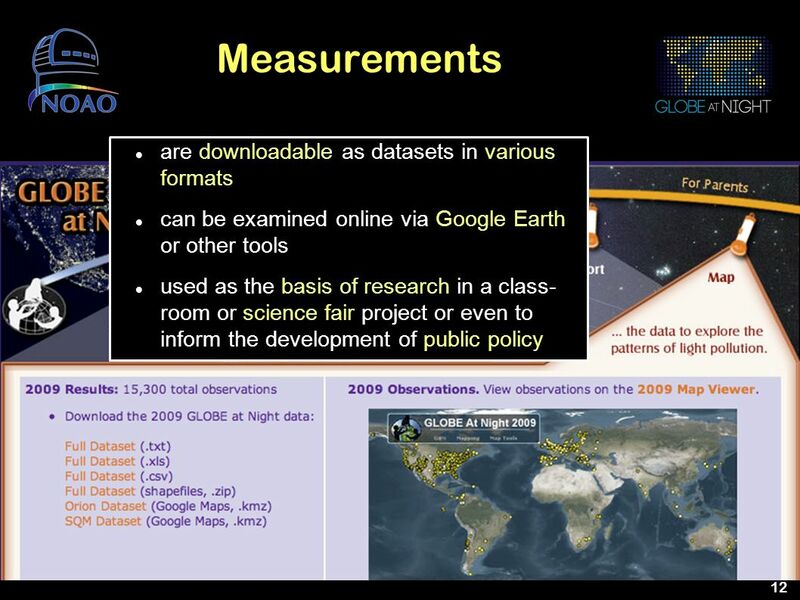 Measurements are submitted on-line and resulting maps of all worldwide observations are created. 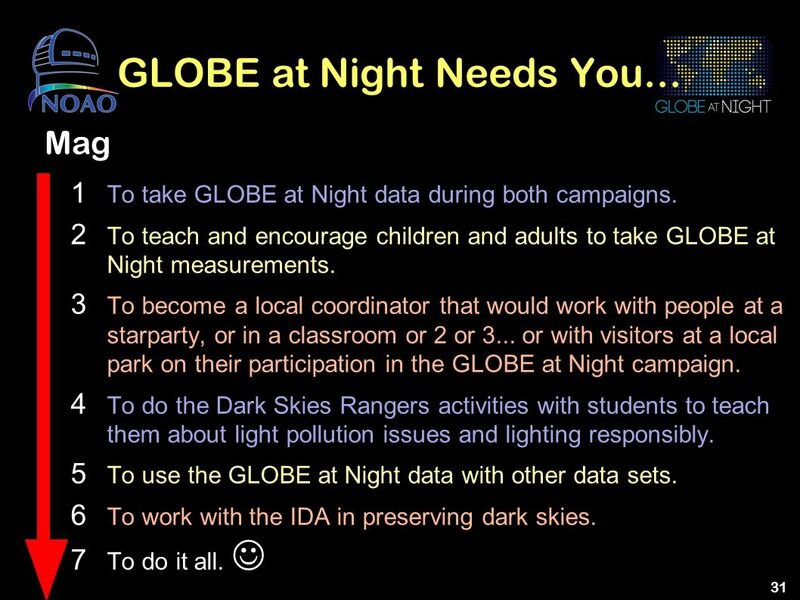 Over the last 5 annual two-week GLOBE at Night campaigns, 52,000 measurements have been contributed from over 100 countries. 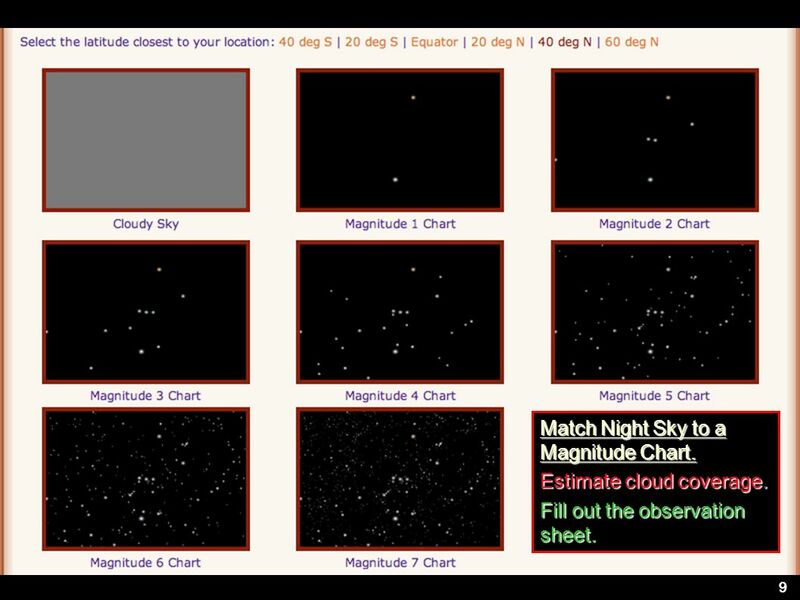 9 Match Night Sky to a Magnitude Chart. 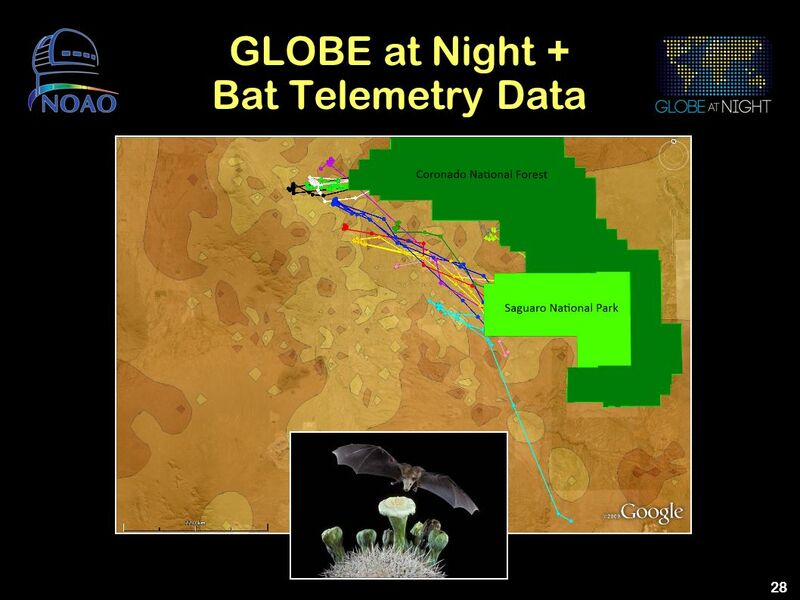 Estimate cloud coverage. 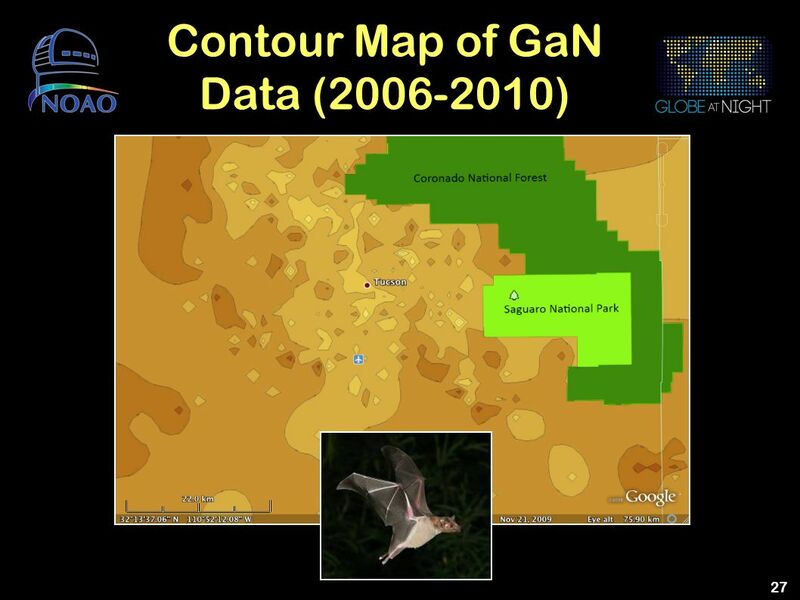 Fill out the observation sheet. 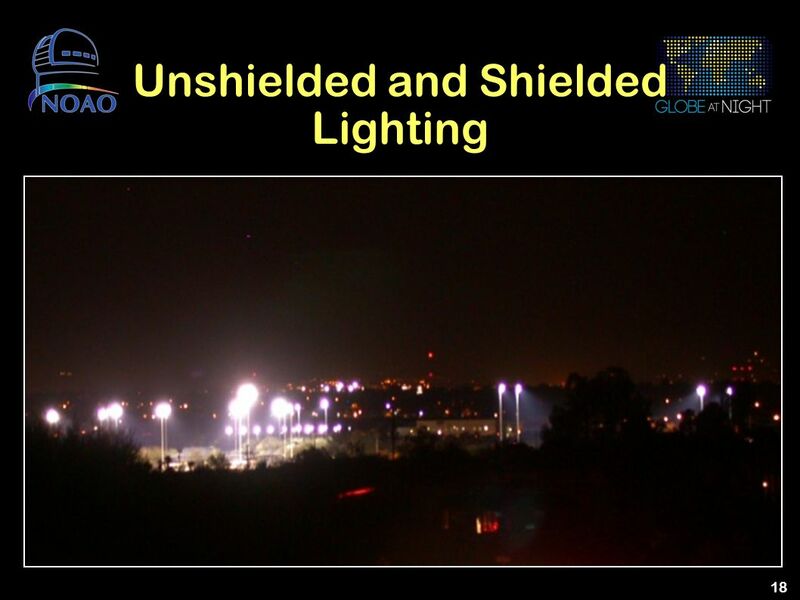 These two ball fields show a good contrast between unshielded and shielded lighting. The field on the left is producing glare and so much of its light is wasted going into the sky. 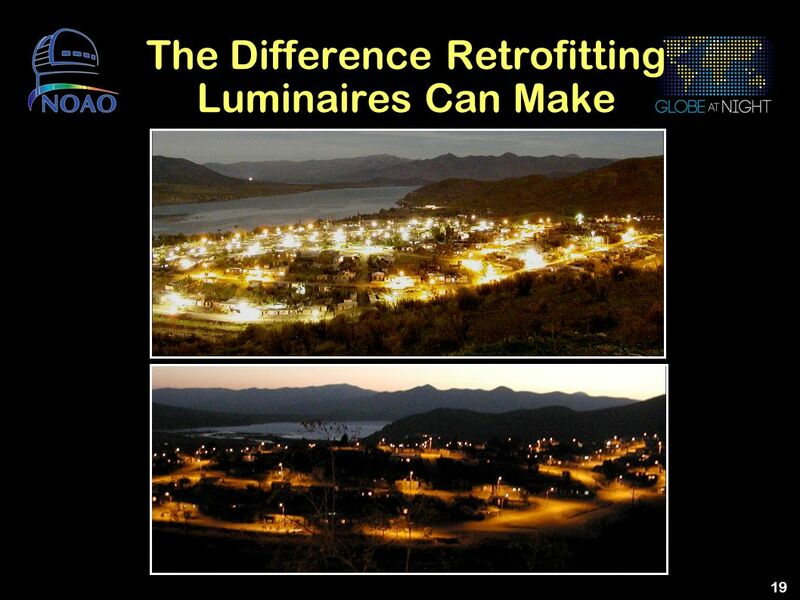 The field on the right has much less impact on the surrounding area because it is only lighting the field, not the neighborhood. Which one would you rather live next to? 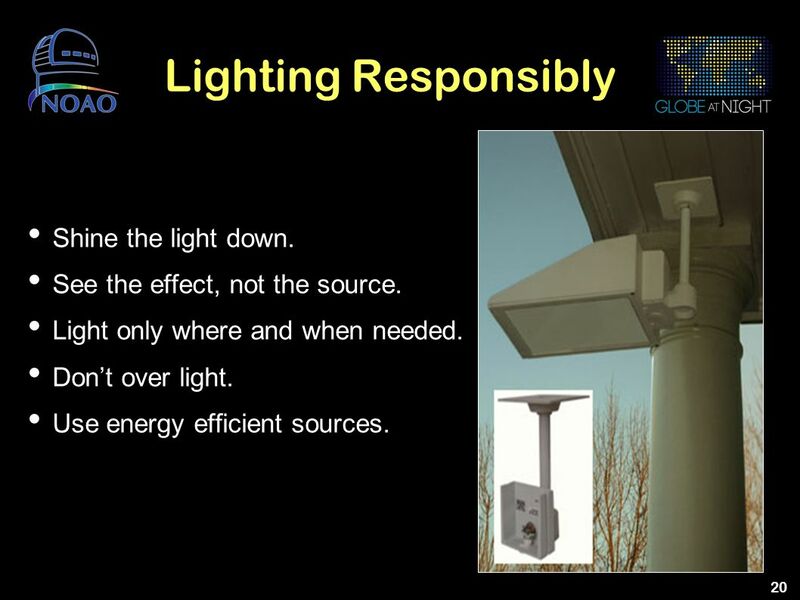 20 Lighting Responsibly Shine the light down. See the effect, not the source. Light only where and when needed. 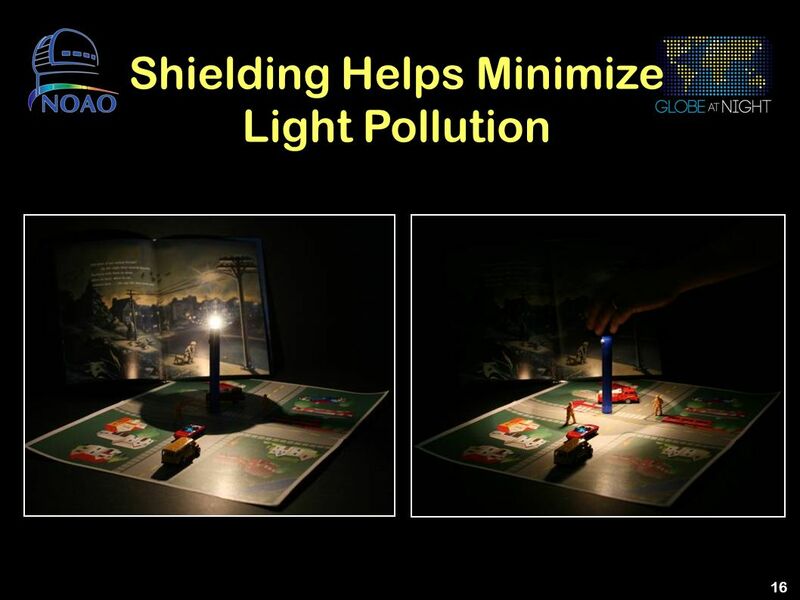 Don’t over light. 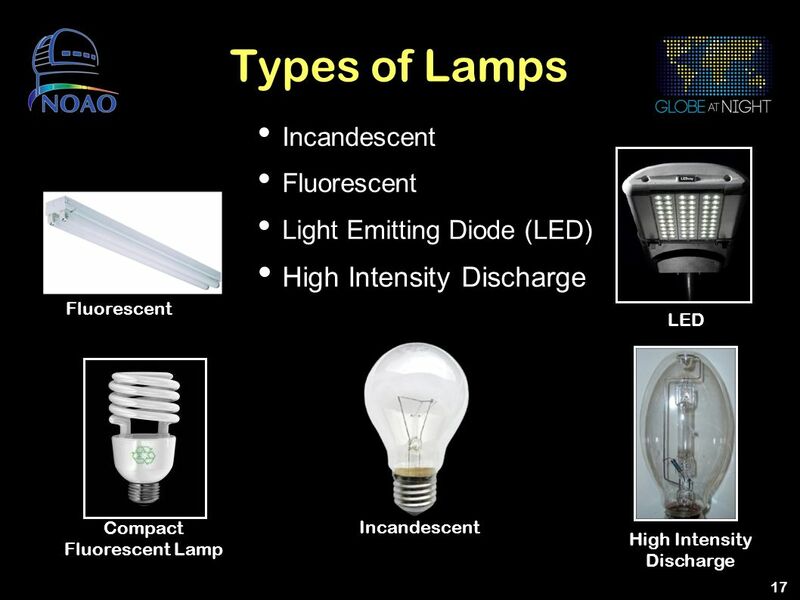 Use energy efficient sources. 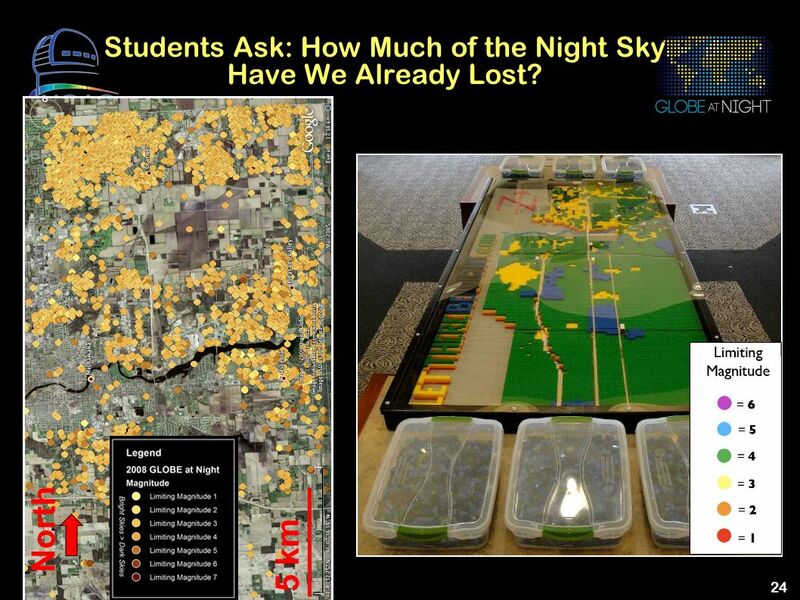 24 Students Ask: How Much of the Night Sky Have We Already Lost? 5 km North Penn-Harris-Madison School Corporation (District) near South Bend, IN. 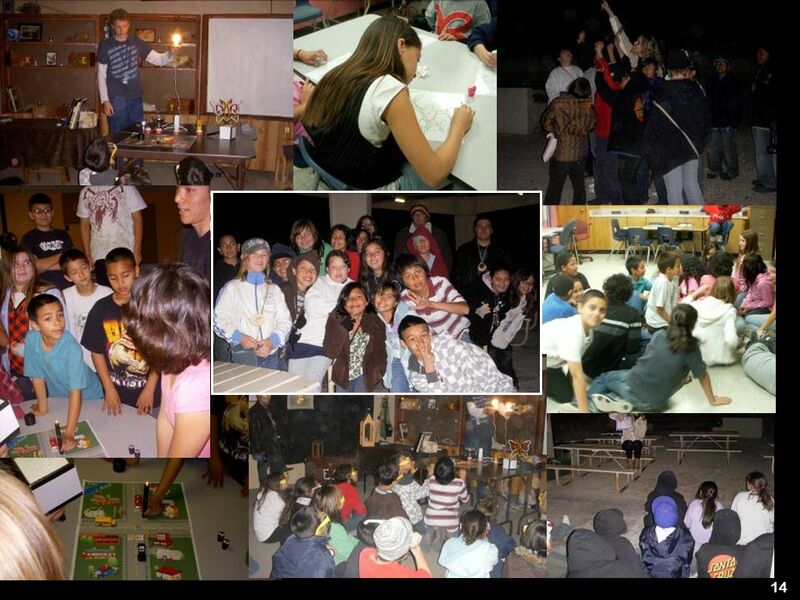 An on-line community with Facebook and Twitter – done! 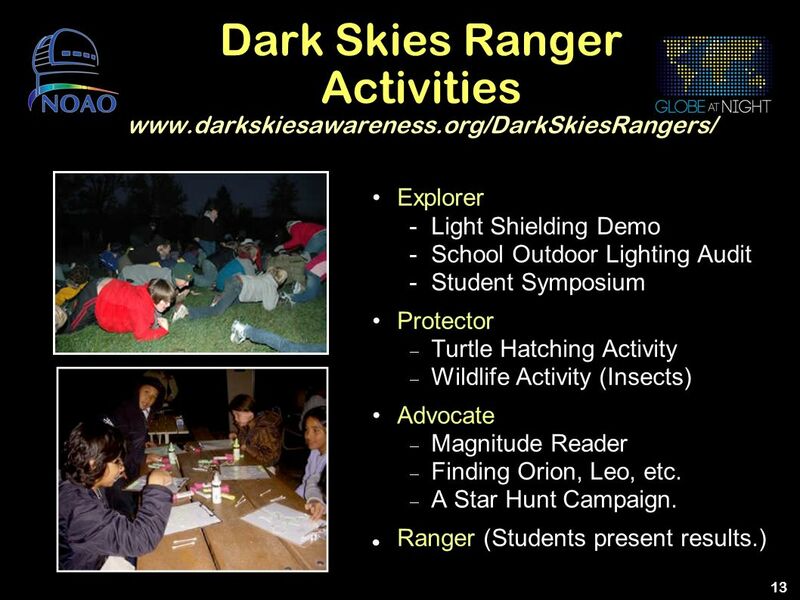 On-line tutorials of the Dark Skies Rangers activities – half way done! 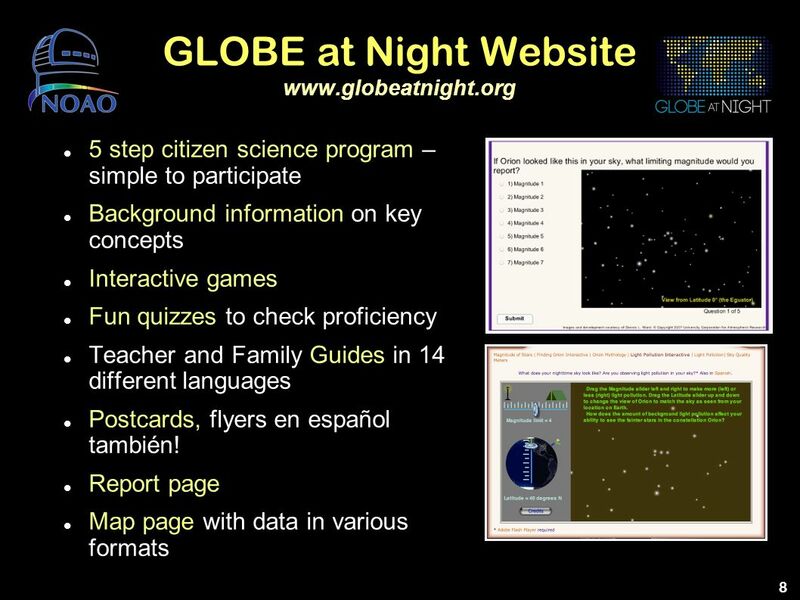 A web application to submit GLOBE at Night data using mobile devices – help us test the app! More monthly campaigns – on their way! 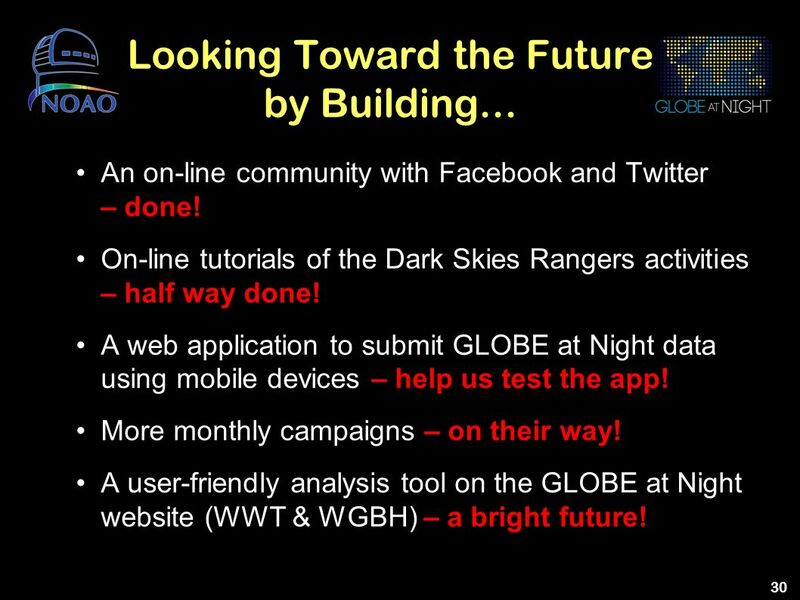 A user-friendly analysis tool on the GLOBE at Night website (WWT & WGBH) – a bright future! 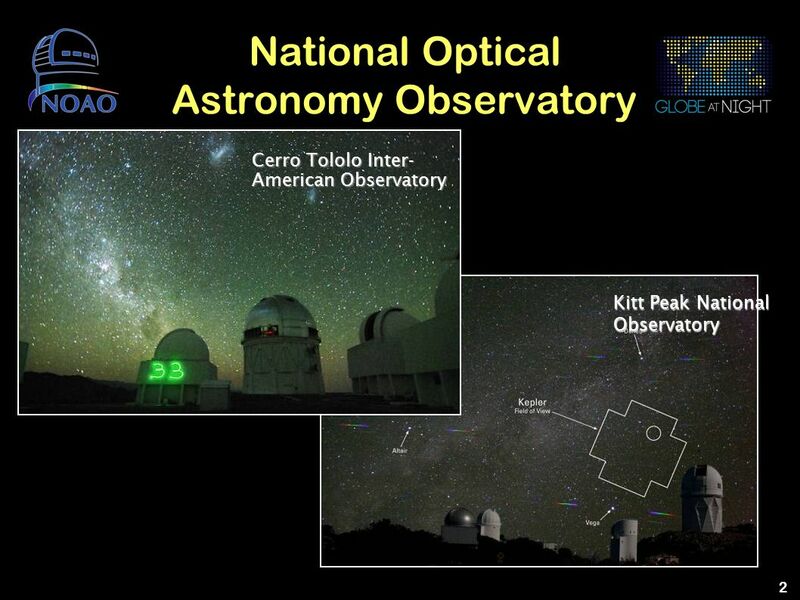 February 21 to March 6 for both Northern and Southern Hemispheres Uses Orion. March 22 to April 4 for Northern Hemisphere Uses Leo. 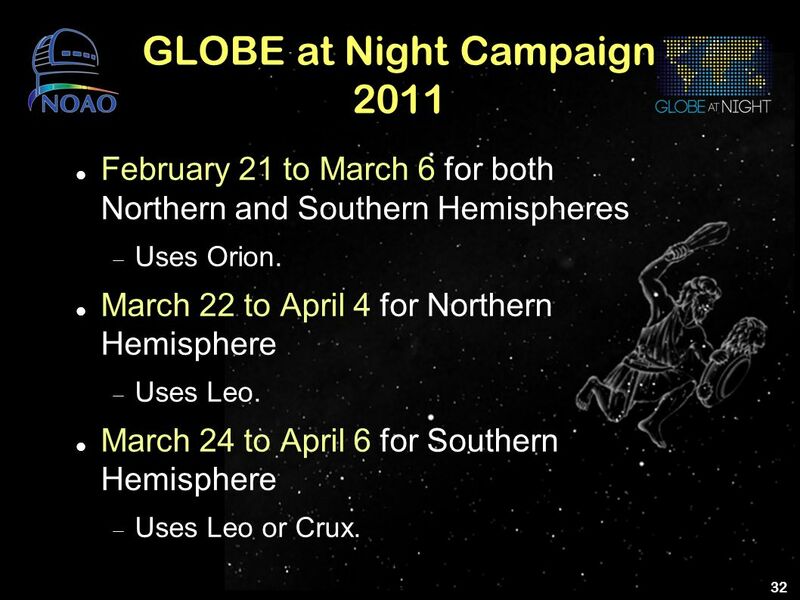 March 24 to April 6 for Southern Hemisphere Uses Leo or Crux. 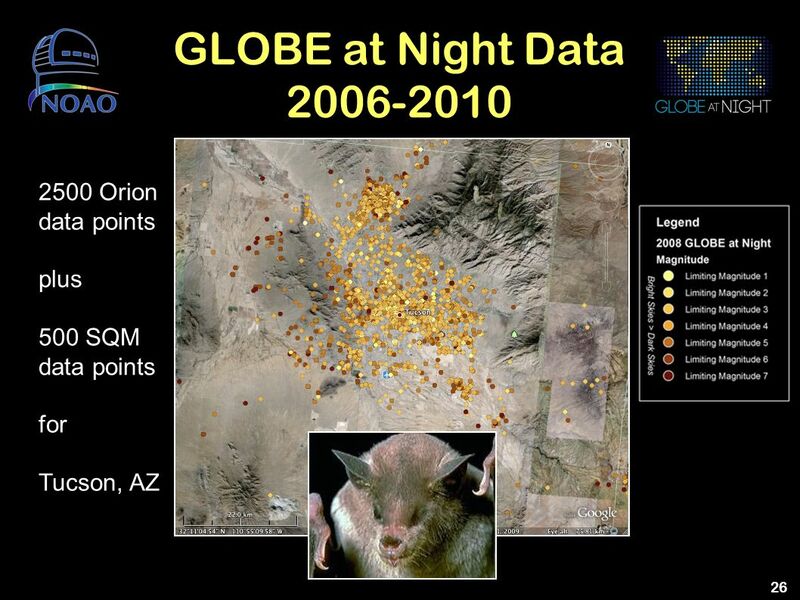 GLOBE at Night ( has been a collaboration between the National Optical Astronomy Observatory (NOAO) in Tucson, AZ; The Global Learning and Observations to Benefit the Environment (GLOBE) Program, in Boulder, CO; the Environmental Systems Research Institute, Inc. (ESRI) in Redlands, CA; the International Dark-Sky Association (IDA) in Tucson, AZ; and the Centro de Apoyo a la Didactica de la Astronomia (CADIAS) in Altovalsol, Chile. 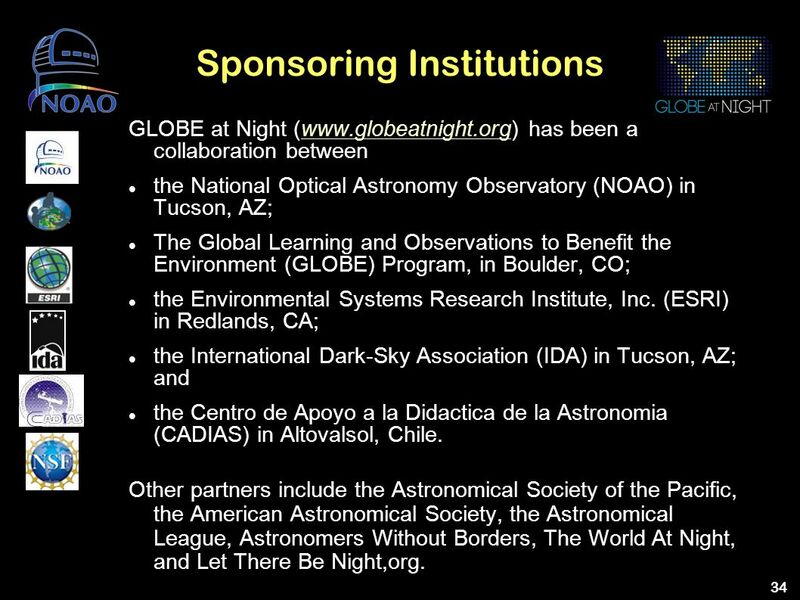 Other partners include the Astronomical Society of the Pacific, the American Astronomical Society, the Astronomical League, Astronomers Without Borders, The World At Night, and Let There Be Night,org. 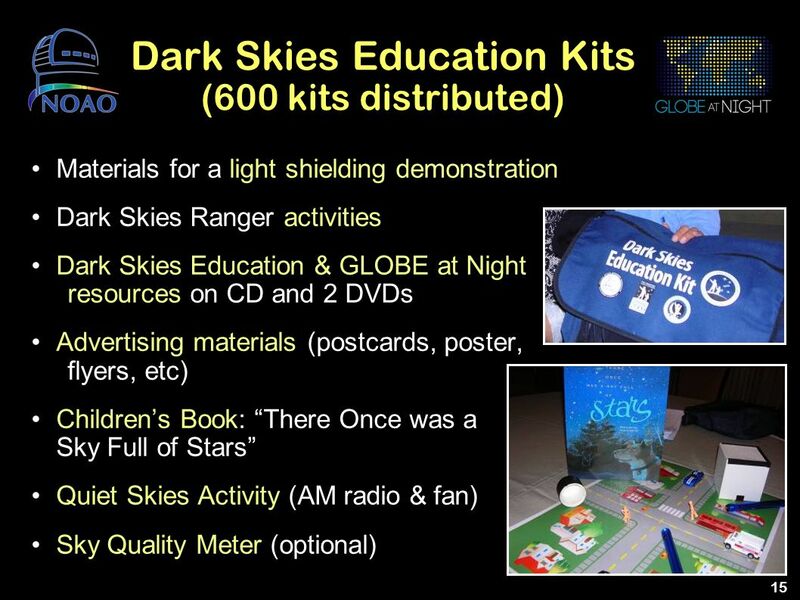 Download ppt "to Promote Dark Skies Awareness:"